Home Volunteer Appreciation CTN Recognizes Our Outstanding Volunteers During Volunteer Appreciation Week! 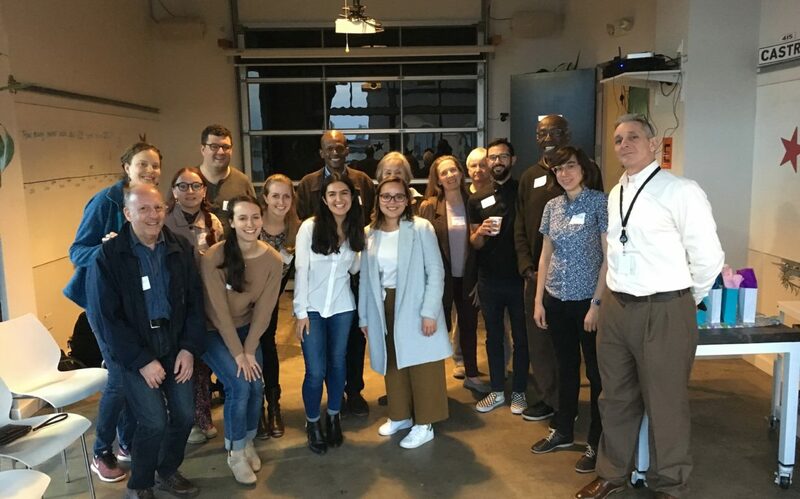 Last Tuesday, CTN hosted our annual Volunteer Appreciation Party to celebrate the work and commitment of our volunteers across the Bay Area. Volunteers are the secret sauce that make CTN’s work possible, and we want to highlight their hard work and dedication! We were lucky to host the event in Exygy’s gorgeous indoor/outdoor space in the Mission. Staff and volunteers came together to mingle and have fun. In addition to the food, drink, and games (including a raffle! ), we also recognized five particularly outstanding volunteers during the volunteer awards portion of the evening. Anna has been volunteering at Centro Latino for almost a year and has truly become part of the community there. She has done a wonderful job of increasing participation in the computer lab, building a strong group of regulars and introducing many users to the computer for the first time. Her consistency, friendly presence, and initiative in engaging people in learning activities that connect to their lives and their interests truly makes her an outstanding volunteer. She also works full-time in San Jose, and were are so grateful that she continues to volunteer with us! We are thrilled to recognize Derek as an outstanding volunteer, always working in service of CTN’s mission. Derek volunteers at Rosa Parks, a site where it can be a challenge to build user participation. Derek has never let this hold him back, and he has built strong relationships with both staff and learners, ensuring that digital literacy training is available to those in that community. This dedication has clearly paid off, and he has built a group of regulars that return week after week. That he does this while working a full-time job is truly amazing and embodies what we hope to accomplish through CTN’s mission. Brett has been volunteering with us for over a year now, currently at Aquatic Park Senior Center. He has consistently gone above and beyond, imbuing his work with a thoughtfulness that has meant that he’ll try every solution to problems that others would give up on. He also demonstrates an ability to find creative ways to engage learners in the digital world. All of this is clear through the feedback from learners and partners and the level of thought and detail he puts into his hours reports. We are lucky to have him as a CTN volunteer. Newton has been involved with CTN for many years, and in his current role, he is a “permanent sub.” Several of our computer labs only open when there is a volunteer present, and Newton is always happy to jump in and tutor at those sites when the regular volunteers are unable to come in. His flexibility is hugely valuable to both CTN and our partners, and often Newton is the reason many learners have access to a lab when they otherwise wouldn’t. We are incredibly grateful for his continued involvement as a CTN tutor! Last but not least, Elsie is the recipient of the Humble Heart award for embodying the heart of CTN’s work. Her dedication to the learners at Downtown Senior Center and her desire to keep learning is emblematic of our ethos at the center of all of CTN’s work. Her consistency throughout the years is incredibly valuable to us, Downtown Senior Center, and the learners she helps. To these volunteers and all who have volunteered with CTN, we truly appreciate all that you do! For information about volunteer opportunities contact volunteer@communitytechnetwork.org.